Pre-packaged with DOSBox. Includes Ultima Underworld II: Labyrinth of Worlds. 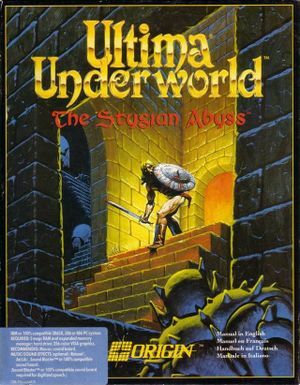 The Ultima Underworld 1 Patch is needed for floppy disk versions. The CD-ROM and GOG.com versions are already fully patched. An unofficial General MIDI patch is available here as well. Use Underworld Exporter to play in higher resolutions, add mouse look, listen to higher quality/custom music, etc. Can also be used to play Ultima Underworld II: Labyrinth of Worlds, but it is only partially supported at the moment. Download and install the latest Github release. Find config and open it with your text editor of choice. Find Path_UW1= and place the path to your Ultima Underworld installation folder after the “=”. That is, the folder with CRIT, CUTS, DATA, etc. To add music, download Music.Packs from the same location as the releases and extract. Afterwards, go into config, find UW1_Soundbank=, and then place the path to the folder containing your music of choice after the “=” . 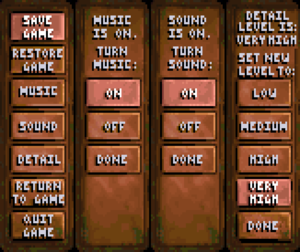 The music pack gives one the choice between MIDI, Soundblaster, and PSX (PlayStation 1) versions of the OST. One can use their own music files if they are in .ogg format. To use with the GOG version of the game, one must extract the files from game.gog; the folder UW is all one needs. One method is to rename the file from game.gog to game.iso and then extracting the files using WinRAR or 7-zip. Chinese, Korean and Polish retail versions only have the manuals translated; the game itself is still in English. The GOG.com version's sound is incorrectly configured by default to use the Roland MT-32. As the Roland MT-32 predated General MIDI, the sound effects will not match with what's normally expected. This fix will also change the music's quality. You can also adjust these settings using INSTALL.EXE or UWSOUND.EXE if they are present. Right click Ultima Underworld 1 and choose Show Package Contents. Right click Ultima Underworld 1.boxer and choose Show Package Contents. In DOSBox command prompt, type mixer /listmidi to view the devices. In the configuration file, under section [midi], change midiconfig=0 to match the associated listed midi id (usually 1). Munt requires the Roland MT-32 ROM which is not distributed in the same package. As an alternative, it may also be possible to try an alternate Software MIDI with a soundfont similar to the Roland MT-32. The Roland MT-32 has support for reprogramming sounds. Therefore installing a soundfont-based MIDI and using an equivalent soundfont may not be an ideal solution in the general case. The cursor may jump around in-game or mouse control may feel sluggish (especially on menu screens). To fix the first issue, disable joystick functionality; to fix the second, increase mouse sensitivity. Change sensitivity from 100 to 200. Experiment with this figure until your mouse feels right. This page was last edited on 21 April 2019, at 23:59.